We prepared a simple and very popular baby dress model for your baby. This baby tunic pattern may seem a bit daunting for beginners, but if you follow the steps carefully, it is possible to knit easily. The front and back pieces are knitted in the same way. Collar and arms are knit separate. We have listed the materials you need to make this baby tunic. 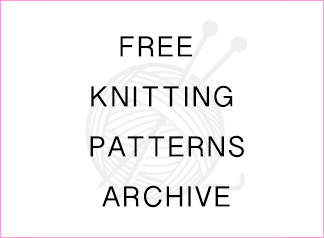 I can not wait to answer your questions about Knitting Pattern. This pattern can be great choice for those looking free baby dress knitting patterns. Cast on 113 stitches. Knit garter stitch for 2 cm, and apply the model on the diagram. Knit body for 27 cm and while changing to garter stitch, cast off 1 stitch 48 times spacing 2 stitches in the first row. While knitting 3 ridges of the garter stitch, work as follows in the last row: purl 4, cast off 1, yarn over, purl 4, cast off 1, yarn over. Change to knit stitch. Knit body for 29 cm and cast off 3+2+1+1 stitches at both sides for the armhole. When the body measures 35 cm, knit 28 stitches on the right side for the neck and keep remaining 23 stitches. Continue knitting, working 28 stitches as follows: knit 23 and knit 5 garter stitches. 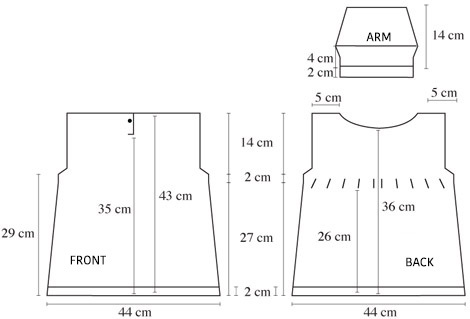 When the body measures 39 cm, open 1 buttonhole on the back middle part. When the body measures 43 cm, cast off stitches together and bind off. Knit 23 stitches kept on the left side. Increase 5 on the needle on the back middle part and knit garter stitch along the body. When the body measures 43 cm, cast off stitches together and bind off. Sew the increased 5 stitches on the left side inside 5 garter stitches on the right. Knit as the back body. Knit body for 36 cm and cast off 9 stitches in the front middle part for the neck. Continue knitting in 2 pieces. Cast off 3+1+1 stitches in every row at both sides of the neck. When the body measures 43 cm, the remaining each 16 stitches on the shoulders are cast off together and bound off. Cast on 40 stitches. Knit garter stitch for 2 cm and change to knit stitch. It is increased 1 stitch 19 times, spacing 2 stitches in the first row and it is increased to 59 stitches. After knitting for 1 cm, increase 1 more stitch at both sides and continue knitting with 61 stitches. Knit the sleeve for 4 cm and cast off 3+2+1+1+2+3+4+5+6 stitches in every row at both sides for the armhole. When the sleeve measures 14 cm, cast off remaining 7 stitches together and bind off. Knit the other sleeve in the same way. Pick up 68 stitches on the needle around the neck and knit garter stitch for 2 cm. Then cast off all stitches together and bind off. Pass the ribbon through the openwork.